ANALYSIS — Voters in 2016 repeatedly heard Democrats cry out against negative Republican rhetoric, especially from the party’s presidential nominee Donald Trump. “When they go low … ?” came the call at rally podiums. “We go high!” constituents would shout. 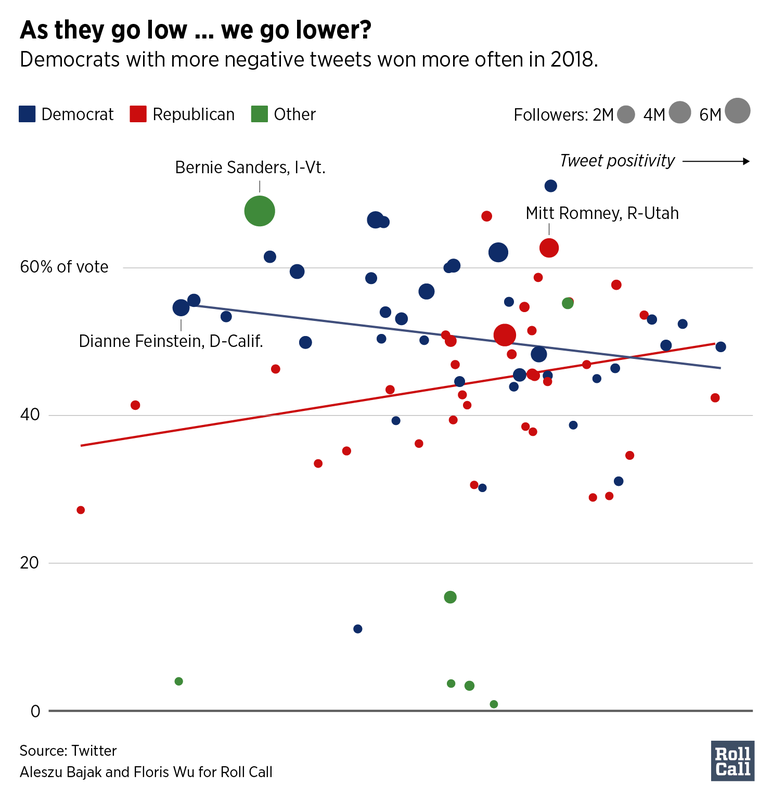 But a new analysis that grades the average positivity of tweets from candidates running for Senate in 2018 finds it was Democrats this past cycle who most often “went low” on the social media platform — and doing so correlated with winning. Of 33 Democratic Senate candidates analyzed, 19 tweeted more negatively on average than the rest of the field. Fifteen of those 19 would go on to win their elections. “Senator Heller has repeatedly threatened protections for pre-existing conditions. He knows it, and now he’s lying about it. Don’t be fooled. #NVSen,” tweeted Jacky Rosen of Nevada. Rosen employed a much more negative Twitter strategy than her incumbent opponent, Dean Heller. She ended up winning that hotly contested seat. In less competitive races, Democrats also tweeted more negatively than their Republican counterparts. “Listen to the crying. This is what @realDonaldTrump’s cruel policy is doing to vulnerable children,” tweeted Sen. Bob Casey of Pennsylvania in June 2018 in response to the audio that emerged from detention centers near the U.S.-Mexico border. This kind of negative sentiment on Twitter turned out to correlate with winning for Democrats running in 2018. That’s the conclusion reached after analyzing more than 120,000 tweets from the 68 candidates who tweeted regularly while running for Senate in 2018. The biggest finding: Democrats who published more negative tweets tended to fare better. The opposite was true for Republicans. Among Democrats running for Senate in 2018, Feinstein, Casey and Sen. Robert Menendez of New Jersey were the most negative on Twitter leading up to the midterms. All three won their races. On the other hand, Deb Fischer of Nebraska and Mitt Romney of Utah all handily won their races while scoring among the most positive on Twitter among Republican candidates. Kevin Cramer of North Dakota, who went on to unseat Heidi Heitkamp, did so with a more positive message than the Democratic incumbent. Likewise, Rick Scott’s winning campaign in Florida was more positive, based on our analysis, than Bill Nelson’s. For Democrats who ran for Senate, the more positive tweets they had, the fewer votes they received. The opposite was true for Republican candidates. These methods come with caveats. Though we used a popular sentiment dictionary to score words with a positive or negative value and derived an average score for each tweet meant to balance out the scores of individual words, there are instances of incorrectly labeling something. “Missoula is fired up! #mtpol #mtsen” tweeted Montana Democratic Sen. Jon Tester on Nov. 4, including a photo of himself at a rally. The tweet was errantly categorized as negative. Machines still aren’t very good at inferring context and sarcasm. That’s why we validated our results with a statistical model trained on Internet Movie Database reviews that attempts to improve scoring accuracy by taking into account the context of a paragraph and not just its component words. Both methods showed the same pattern of sentiment from Senate candidates on Twitter. What a candidate says on Twitter — or how they say it — won’t decide an election, and these findings aren’t to say that Democrats’ negative tenor on social media necessarily gave them an advantage. But it’s interesting to see that the we-go-high party of 2016 actually fared well in 2018 while tossing plenty of shade on the internet. Our study also found that the more followers candidates had, the more votes they received. Again, Democrats had on average more followers and more votes. We also saw that the closer the election date, the more candidates tweeted; and candidates were generally more positive on Twitter as they approached Election Day. 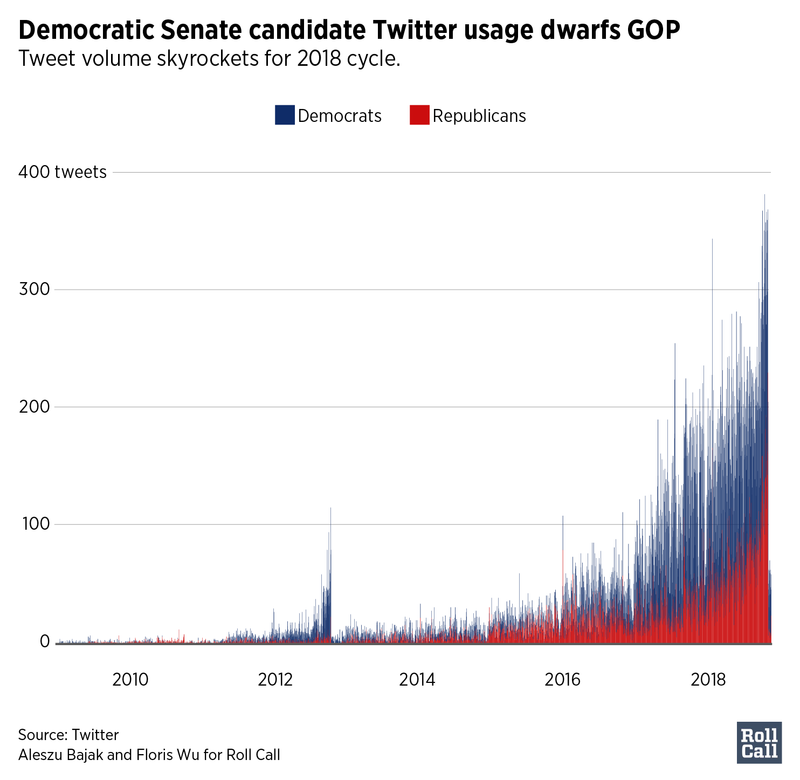 This analysis used 124,435 tweets from 68 Senate candidates who consistently tweeted in the lead-up to the 2018 midterms. The tweets, some of which date back to Feb. 14, 2009, were downloaded using “rtweet,” a software package developed by Michael W. Kearney from the University of Missouri. The tweets are either from the candidates themselves or their official campaign accounts. The “rtweet” package relies on the Twitter API, meaning we’ve collected no more than 3,200 tweets per account as limited by Twitter. More prolific candidates accordingly have samples that cover narrower and more recent time spans. We ran this dataset of tweets through a 10,222-word database developed by researchers at the Computational Story Lab at the University of Vermont that is designed to assign an average sentiment to inputs. Based on this dictionary, each tweet was scored on an average sentiment scale and compared to the original results. To validate these sentiment scores, we used a machine learning model trained on 50,000 IMDB reviews to evaluate the sentiment of each tweet and classify each as either “positive” or “negative.” We then calculated the percentage of positive tweets for each candidate. Aleszu Bajak teaches science writing and data journalism at Northeastern University. His writing has appeared in The Washington Post, MIT Technology Review and Nature.Floris Wu is a graduate student studying data science and journalism at Northeastern.